Combine dry ingredients in a bowl. Set aside. In a small bowl, whisk egg, cream and butter; blend into dry ingredients. Whisk until smooth. Gently fold in blueberries. Pour batter onto hot greased griddle, two Tablespoons at a time. Cook over medium heat until bubbles pop and stay open, then turn over and cook on the other side until golden. 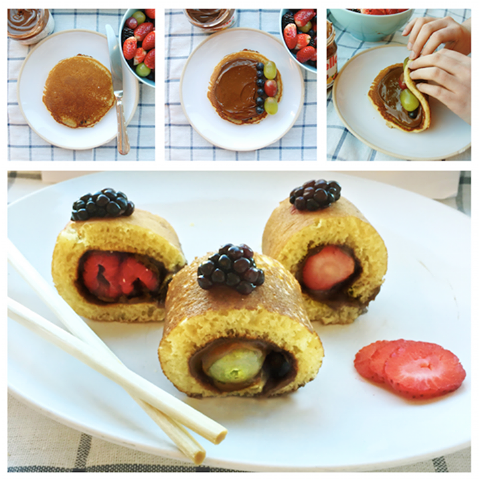 These pancakes can be frozen, which means that you can make them on the weekend and have a healthy, convenient, fast breakfast on weekdays! If you’ve ever wished that you could pop an Eggo waffle in the toaster without it spiking your blood sugar – well, now you can! It’s not an Eggo, but it’s so much more healthy – but just as convenient! Isn’t that great? I’m the first to admit that most low carbohydrate blueberry muffins, while keeping my blood sugar in check, don’t taste as good as the real McCoy. Today I want to share a little trick I’ve learned that will enable type 2 diabetics to enjoy the real McCoy and keep blood sugar in check. It’s called “piecing” or “pinching”, and believe me, it works! You can’t “piece” or “pinch” if you don’t work out. If you are not exercising, this won’t work for you. But you can have a little bit of real as long as you work it off. After my workout at the gym, I headed over to my favorite breakfast spot, The Egg Crate. They make the most wonderful blueberry muffins in Wichita! If I were to dig in and eat this whole muffin, my blood sugar would spike – and that’s not good. I will begin by eating an egg. You can have whatever style egg you want – I just crack open an egg and whisk it up in a mug and microwave it so I can eat it quicker. Add a little cheese if you want – it’s low or no carbohydrate so that’s fine. Always eat protein first! Eat just a pinch of your muffin and enjoy it with coffee or tea if you wish. Then wrap it with foil so it doesn’t dry out. Check your sugars in a couple of hours. If they’re okay… you can eat a cheese stick, then another pinch of your muffin. Eating pinches of carbohydrate-rich foods is not a new concept, but it’s one that works! I don’t know why eating protein makes carbohydrates nicer to my body, but I’m sure glad it does! If you’re exercising on a regular basis and eating plenty of vegetables every day, there’s no reason you can’t introduce a complex carbohydrate following a little protein. Maybe that’s why dessert forks are smaller than dinner forks. The idea is that we can eat as much protein and vegetables as we want, but when it’s time for dessert, we need to dial back our enthusiasm a bit and try to think about what we’re eating and how it will affect our blood sugar. Sometimes breakfast can be as simple as a bowl of steel-cut oats with a few blueberries on top. Once in a while I just eat the blueberries by themselves. I don’t always have to do much prep work to enjoy blueberries. I’d go to a lot of trouble to make a great coffee cake! Fortunately, this recipe is not that difficult to follow, so I can have a piece of moist, melt in your mouth coffee cake in the afternoon with coffee. At only 4g of carbohydrates per piece, there is absolutely no guilt associated with eating it. That’s a wonderful feeling! Preheat oven to 350 degrees. Spray 9×9-inch pan with PAM. Mix 1 cup of the almond meal, 1 teaspoon cinnamon, ½ cup sweetener, a pinch of salt and the 4 Tablespoons butter until crumbly. Set aside. Mix cream cheese, 1 egg, and ¼ cup sweetener. Set aside. Mix 2 cups of almond flour, baking powder, baking soda, ¼ teaspoon cinnamon, ½ teaspoon salt, and ¾ cup sweetener (if using a powder). Set dry ingredients aside. Blend the sour cream (or yogurt), oil, extracts, liquid sweetener (if using), and 2 eggs and mix well. Add the mixed dry ingredients and blend well. Spread the cake layer in the pan, and spread the cream cheese on top (if it’s the larger amount of cream cheese, you won’t be able to spread it evenly, but that’s OK). Then sprinkle the blueberries on the cream cheese and the streusel on the top of that. Bake for 30-40 minutes or until toothpick not inserted into center comes out clean. Cool and slice. UPDATE: I just this moment walked in the door from a doctor’s appointment. My A1c has gone from 8.9 back in April to 6.2!!! I told her that I’ve not been needing my Levemir and she told me I could discontinue it – PRAISE THE LORD! But wait… there’s more… she also told me that I could take just ONE Metformin in the morning and ONE at night – I was taking TWO in the morning and TWO at night. First, THANK YOU GOD for guiding me to the right pathway. And thank you to my friends in the DOC and others on facebook for all the helpful hints, ideas, suggestions and kicks in the rear when I needed them! And thank you to my doctor for being so patient with me… for keeping that little voice in my head that said, add regular exercise and cut carbs. Why do I post this here? Because there are some who don’t believe that a little activity can make such a big difference in A1c numbers. It can! I take a 30 minute walk on Tuesdays, Thursdays and Saturdays – and go to PLANET FITNESS to tone up and do more cardio on Mondays, Wednesdays and Fridays. It takes about an hour – and they have these amazing massage chairs – sitting in one of those is my reward for doing my workout. That’s what I need – a NON-FOOD reward! I like to have blueberry muffins in the morning once in a while with a cup of hot coffee. Traditional recipes are about 30g of carbs per muffin. I knew I had to find an alternative that was not so carb-rich. This one seems to fit the bill. Preheat oven to 350 degrees. In a large bowl, mix coconut flour, Splenda, baking powder and salt. In another bowl, mix wet ingredients – eggs, butter and vanilla extract. When well mixed, add wet ingredients into dry ingredients and mix well. Add in blueberries. You can use a regular 12 cup muffin pan or a 6 cup muffin pan for a larger muffin. Scoop in batter until half filled. Bake for 20-30 minutes or until toothpick comes out clean. 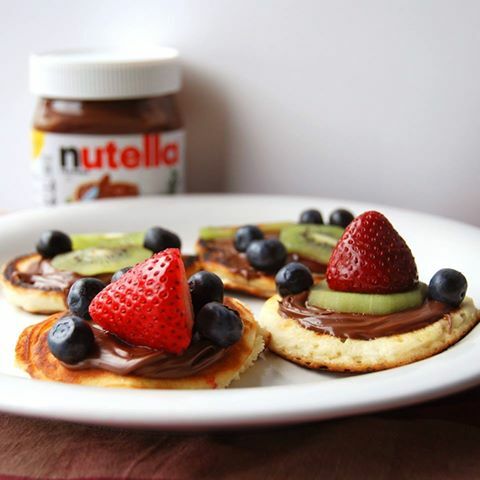 The most popular way to enjoy Nutella is on toast or pancakes. It’s fun and healthy to add blueberries or strawberries to the mix. Pineapple rings and kiwi fruit taste pretty good with it too. Is it a snowy February where you live? Are you having a craving for chocolate? 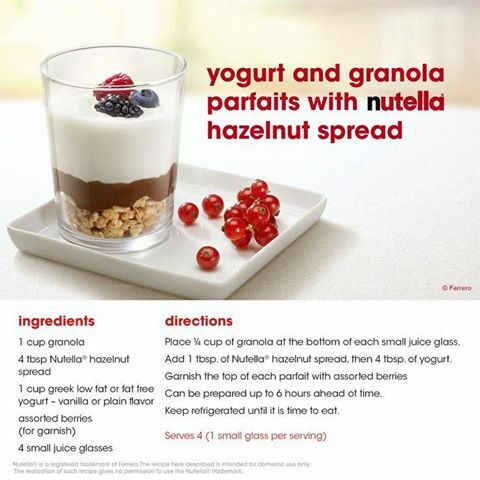 Nutella is a great way to curb the craving without breaking the calorie bank – especially on a snowy day! Nutella and banana slices are good on English muffins. I’m making myself hungry! How about a high protein cake in a mug using Nutella??? 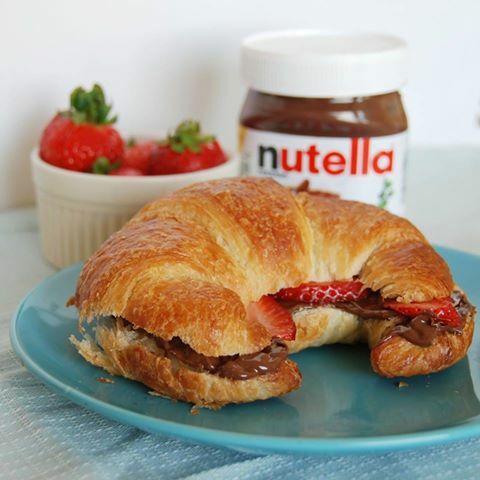 Croissant with Nutella and strawberry slices??? Very nice! Remember the days before Nutella when we ate peanut butter and banana sandwiches? Now that Nutella is here, we replace regular peanut butter and get a better sandwich. There is no hydrogenated oil in Nutella and there is cocoa in it, so hey – if there is chocolate in my spread… that makes me very happy – how about you??? With all this butter, I can’t promise that this is the most healthy recipe I’ve ever seen, but it does look good. I wouldn’t recommend eating the whole thing in one setting. 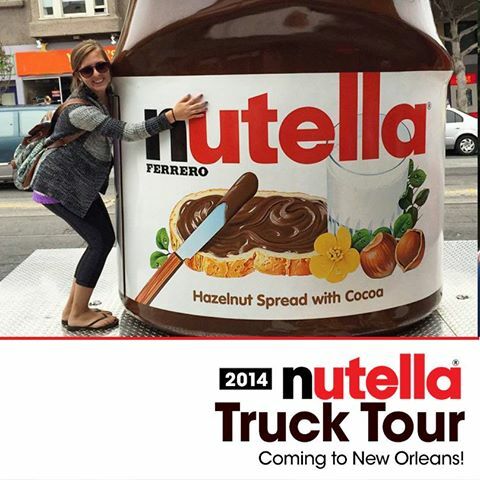 Have you heard of the Nutella “Spread the Happy” Truck Tour? They’ve taken it on the road! This video is from July 2014 – and at that time they were celebrating 50 years of spreading happy! I had no idea it had been around that long! I like no bake cookies. These are fun and easy – and delicious!